Tom and Renae Morog of St. Lawrence had just over 2 feet of snow fall on their farm, with a 7-foot drift against one of their barns after the April 10-12 blizzard. Underneath 2 feet of snow, roads remained muddy at the Tom and Renae Morog farm in St. Lawrence. Between Wednesday and Friday, parts of South Dakota saw more than 20 inches of snowfall. The Huron-Miller-Redfield triangle got the worst of it with more than 25 inches. Snow, coupled with 50 mph wind gusts, caused more than 100 accidents in the first 24 hours of the blizzard. The storm wasn’t entirely unexpected, according to state climatologist Laura Edwards, and more severe storms will most likely be the future. With an estimated $3 billion in impact to the economy from the recent storm and the first bomb cyclone that left heavy snow and major flooding in mid-March, producers are feeling the punches, said Anthony Bly, South Dakota State University Extension soil specialist. For those still stuck in snow and waiting for the spring thaw, there isn’t much anyone can do, Bly said. He recommended that producers look over the planting season plans they made late last year. Because of the seemingly endless moisture beginning in June last year, Bly said farmers can expect a very narrow window for planting this spring. Climate estimates say this spring and early summer will be cool, which doesn’t give farmers a lot of time to get their seeds into the ground. “We can’t dry the snow out. There is no magic wand for that,” he said. As farmers begin to check over their plans, Bly said he hopes producers begin reaching out to those in their areas that have already taken the plunge into no-till and soil health management to learn how to build up soil profiles to survive storm seasons like this one. “This may be the worst year to start with soil health due to the extreme conditions, but this could be the year that it forces your hand,” Bly said. Through his and SDSU’s research, Bly said he’s found that those who no-till or strip-till almost always have a better season than those who don’t. With as little time as farmers will get to get into their field and plant, Bly said now is the time to try something new. Another big worry coming out of the storm was for the livestock industry. South Dakota Gov. Kristi Noem said in a Friday press conference that she is anticipating cattle losses in the state, as many producers have young calves exposed to the drifts that have gotten as high as 6 feet in some areas. The governor urged producers to look into the Livestock Indemnity Program and talk with their local Farm Service Agency offices to figure out the best way to proceed. In some of the harder-hit areas along the Interstate 29 corridor, not only did several thousand houses lose power during the storm, dairies had to dump milk because trucks couldn’t get to them. Drumgoon Dairy in Lake Norton took to Facebook with a video showing milk draining from their storage tanks and snow drifts as high as their vehicles. On Friday morning, 90 percent of South Dakota’s main roads were either closed or under no-travel advisories. For South Dakotans wanting to believe it was a once-in-a-lifetime event, Edwards said most climate trends point to more extreme single weather events in the future. Bly said anecdotally he can’t remember a time where this many major weather events have happened so close together. Even with the trends, Edwards said South Dakotans can assume this is the far end of the moisture spectrum as 2019 approaches record years for both snowfall by the end of April, and moisture depth. The most unfortunate part of the storms, according to Edwards, was the two and a half week gap when temperatures warmed and flood waters rose. “Looking ahead toward next week with warmer temperatures, the river forecasts are going to have to account for snow melt. Tuesday to Wednesday we are going to see rises in those big rivers again,” she said. Because of the flooding, moisture and delays, Edwards said they are expecting to see a lot of areas where producers can’t plant this year, prompting insurance payouts. In relatively good news, Edwards said, the soil has been thawing at faster rates than normal. In that gap between weather events, Edwards said the soil thawed faster than they expected and soil moisture sensors came back alive for the season. Edwards has heard producers call this spring the worst they’ve seen since the mid-1990s. Bly agreed and said he hasn’t seen this amount of moisture since either the mid-'80s or 1993. “This one seems more intense to me,” he said. As farmers ramp up for another weekend of plowing and moving snow, it’s uncertain how the season will play out. Edwards said she’d like to see farmers reach out to one another on how to best manage in their areas and Bly said all farmers can do is remain optimistic that their plans made will work for the season. “There are a lot of things for farmers to try to minimize erosion and manage the water. We don’t need to create new ideas, we just need to implement the tools to manage these extremes while keeping production and profits,” Edwards added. For those struggling, Edwards said she recommends visiting SDSU workshops. 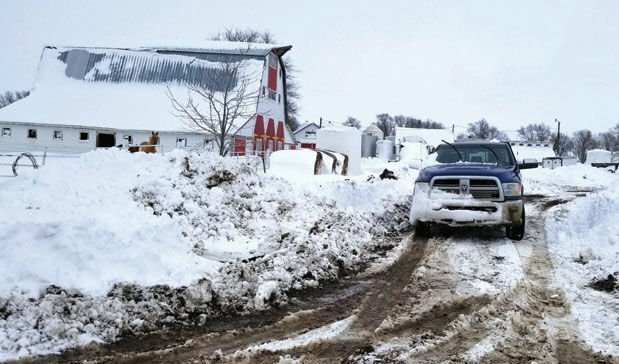 At 10 a.m. on Monday, SDSU is hosting Communicating with Farmers Under Stress at various locations around the state. Later that evening at 6:30 p.m., Extension staff will host a workshop on how to “Weather the Storm in Agriculture” in Aberdeen, Pierre, Sioux Falls and Rapid City. Register online at igrow.org. Reach Jager Robinson at 605-335-7300, jager.robinson@lee.net or follow on Twitter @Jager_Robinson.